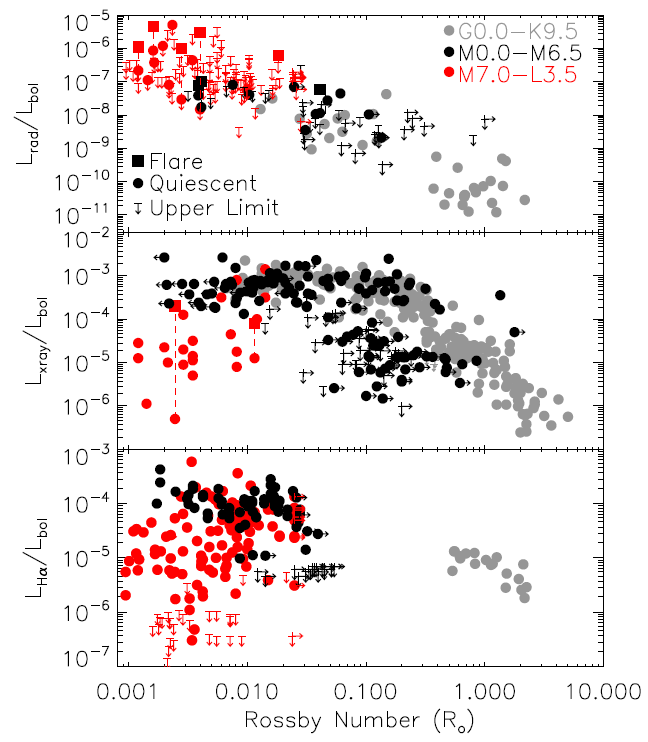 Can we constrain planetary mineralogy of the closest stars? Phase diagram of the simulated interior of an Earth-like planet. It shows the different compounds that make up the mantle for varying depths. Since directly measuring the composition of the solid innards of an exoplanet is far beyond our current capabilities, we often rely on indirect methods to infer about their bulk composition. For instance, if we measure the radius of a planet using the transit method and then its mass using radial velocities, then we can estimate its density. But this relation doesn’t provide enough fine details to allow an inference about, say, the size and composition of the core and mantle of the planet — i.e., its mineralogy. However, our current hypotheses on how planetary systems form suggest that the chemical composition of a star and the planets that orbit around it should be strongly connected. This means that, in principle, we could infer about the mineralogy of a planet if know the composition of the host star well enough. What about the other way around? What is the minimal precision necessary to distinguish unique mineralogy populations for exoplanets? To estimate that, the authors take the extremes of molar ratios in the 10-star sample and compute the maximum uncertainties that would avoid an overlap between populations in these extremes. 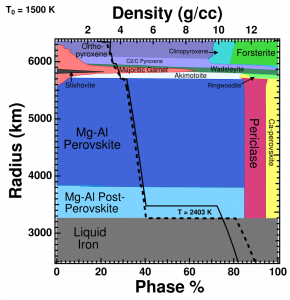 This is done for ratios of silicon, iron, aluminum, and calcium over magnesium (see Fig. 2). Figure 2. Same as figure 1, but with the Sun removed. 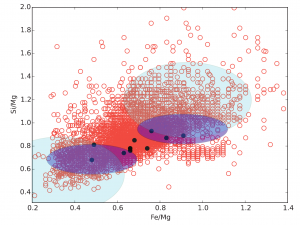 The dark blue circles represent the regions of maximum uncertainties to allow us to distinguish two different populations of planetary mineralogies in extremes of molar ratios of the 10-star sample. If these ellipses overlapped either in the x- or y-axis, then we would not be able to discern mineralogy populations. The light blue ellipses are the same, but for the entire Hypatia Catalog. 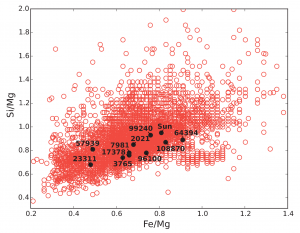 The authors conclude that the minimum precision of stellar abundances necessary to discern differing mineralogy populations is nearly one order of magnitude more stringent than current, run-of-the-mill techniques allow. Although this may sound a bit discouraging, there are in fact research groups that managed to obtain very precise stellar chemical abundances by applying more advanced techniques, albeit applied for more specific targets (e.g., very bright stars or solar twins). With the advent of giant ground-based telescopes and the maturing of these more precise stellar characterization methods, we may, in the near future, be adding a new dimension to the search of habitable planets. Leo is an exoplanet scientist and Ph.D. candidate at the Geneva Observatory. His current research involves characterization of exoplanets, physical and chemical properties of stars similar to the Sun and developing astronomical software. Not to be confused with the constellation. 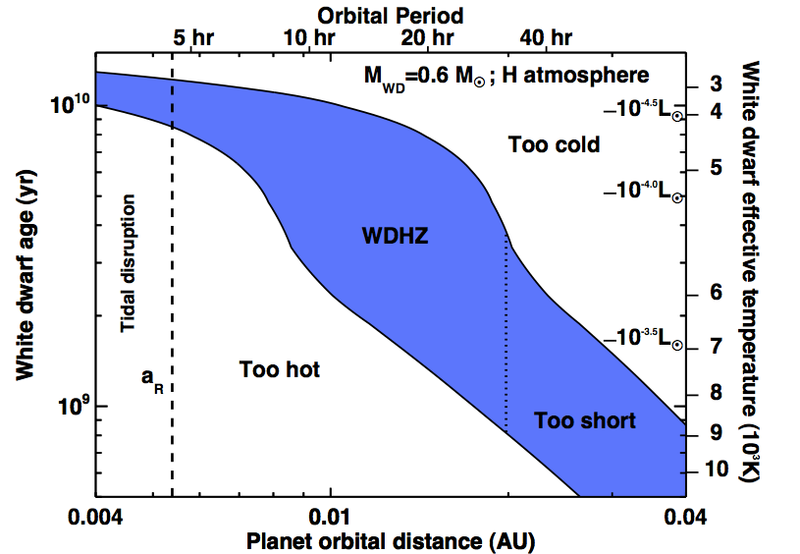 Detecting Transiting Planets Around White Dwarfs The Kepler Exoplanet Census The Radio Activity-Rotation Relation of Ultracool Dwarfs How Hot is Too Hot?